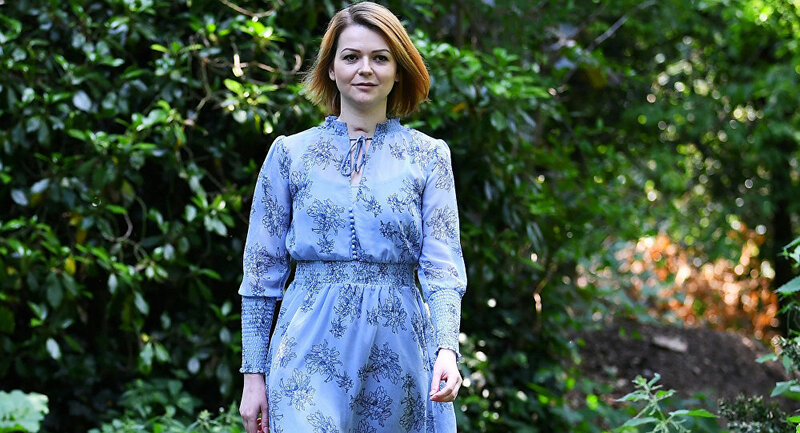 Last week's surprise television appearance by Yulia Skripal, recorded at a secret location somewhere in England, went some way to assuage concerns that many have had for her well-being. "The whole family was incredibly happy to see the video as it at least confirms that she is alive" was the verdict of cousin Viktoria. But other than showing us that Yulia was still alive (and indeed looks well and has a nice new hair-style), what else did we learn from the short broadcast? Precious little is the honest answer. Yulia's statement, which she also wrote down on paper in English and Russian, wasn't all that different from the one released by the British police on 11th April. Then as now, she thanked the Russian Embassy for 'kindly' offering their assistance but said that she wouldn't be availing herself of their services at the present time. Then as now, she also thanked Salisbury hospital staff for their expertise and their kindness. Then as now, she didn't blame Russia. Rather like Sherlock Holmes's dog that didn't bark in the night-time in the classic story 'Silver Blaze', the most revealing aspect of the broadcast was what Ms. Skripal didn't say. Let's suppose she did genuinely believe the 'official' UK government narrative, namely that her and her father had been the targets of an assassination attempt by agents of the Russian state. After all, that is what she will have been told by British Intelligence officers after she recovered consciousness. Given the fact that the British NeoCon government doesn‘t miss a single opportunity to lambast Russia, it scarcely credible that Yulia would have been discouraged from openly voicing an anti-Russian government view. Now, it could be that Yulia herself did not want to point the finger of blame at the Kremlin because she feared that family members back home could be targeted. And that quite understandably she wants to return to live in Russia at some point (as she in fact said in her video broadcast). But it could also be the case that she genuinely doesn‘t believe Russia was responsible. Suppose she thinks it was someone else. She's smart enough to know that she would never be allowed to say this publicly in Britain because of the political repercussions. Too much is at stake. Her safety and security in the UK could depend on her not contradicting what we have been told up to now. There are lots of inconsistencies in the official narrative on the Skripal case but three things in particular smell fishier than a Japanese factory ship. 1) Why didn't they tell us the Skripals were recovering? We only got to know that Yulia was out of a coma and her father was getting better too, after Russian tv broadcast aired, on 5th April, what they said was a phone call between Yulia and her cousin Viktoria, in which Yulia said that "everything is fine, everything is solvable, everyone is recovering and everyone is alive". At first, the UK line was to trash the claim. But when it became obvious that the recording was genuine, the story had to change. The Skripals, who we had been told were on death's door, were indeed undergoing a miraculous, Lazarus-style recovery. A police statement, 'on behalf' of Yulia Skripal was issued less than an hour after the recording was aired. Which begs the question: why weren't we told earlier? Were the authorities concerned that Russian agents would try and sneak into the hospital disguised as cleaners in order to ‘bump off' Yulia and Sergei? Or was there a more sinister motive for maintaining a 'death's door' narrative? What would we have been told if Yulia hadn't made that phone call to her cousin? 2) Novichok: deadly, but then not so deadly. Repeat After Me: (with robotic hand movements) "Novichok is the deadliest nerve agent known to man…Novichok is the deadliest nerve agent known to man.." That was the mantra we were supposed to be reciting up to April 5th. But then when we found out, because of that leaked phone call, that the Skripals' were doing 'fine' the official line changed again. Now it was a case, repeat after me (with robotic hand movements): "Novichok is not so deadly, Novichok is not so deadly…"
Let's suppose that the Evil Putin (Boo, Hiss, By Orders of The Sun newspaper), had decided to bump off the Skripals in a Wiltshire cathedral city. Why on earth would he want to do it on 4th March 2018: just three months before the start of the World Cup to be held in Russia for the very first time, and knowing that Russophobic neocons were looking for any excuse to undermine the tournament and ratchet up their campaign to shut down Russian media outlets, such as RT and Sputnik. In addition, why would Putin want it done just two days before his arch-critic Bill Browder (and the fiercely anti-Kremlin Ed Lucas), were due to address UK Parliamentarians? — Digital, Culture, Media and Sport Committee (@CommonsCMS) 6 марта 2018 г. Regardless of your opinion of the Russian government, you have to agree that the timing, from a Kremlin perspective, was disastrous. But for the enemies of Russia, and there are quite a few of those around, bearing in mind Russia's role in thwarting regime change operations in Syria, it was perfect. Russian diplomatic staff was expelled from Britain and other European countries. Ofcom, the UK media regulator, announced a new investigation into RT. The new Cold War got even colder. I very much doubt we will ever find out the truth of what happened to the Skripals in Salisbury on 4th March. The newly-installed CCTV system clearly didn't pick up any FSB agents. The police haven't summoned anyone to 'help them' with their inquiries or made an appeal for any information regarding an individual wearing protective gear and acting very suspiciously in/around Salisbury on 3rd/4th March. It could be of course that not even Yulia and Sergei Skripal know what really happened. But if they did have a view and it didn't fit with the 'official narrative', would we ever be allowed to hear it? The views and opinions expressed by Neil Clark are those of the speaker and do not necessarily reflect those of Sputnik.